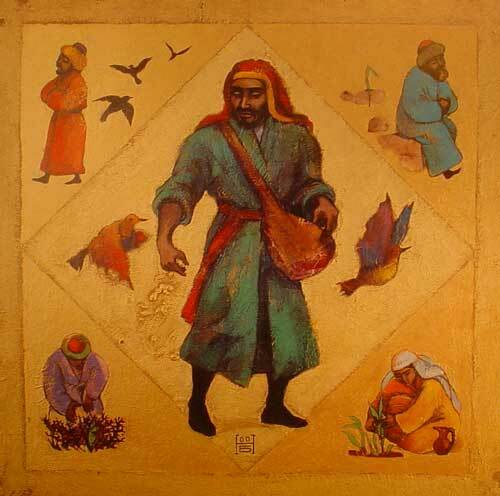 "The Sower" by Kazakhstan Artist Nelly Bube. The suggested reading does not include verses 10-17. However, they are important for the proper understanding of the text. We shall treat them before treating the actual parable. The parables of Jesus are found in blocks in the Gospels. In Matthew 13 we have seven parables. Four were spoken to the crowds and the disciples (verses 18, 24, 31, 33); three were spoken in the privacy of a house to the disciples (verses 44,45 and 47); the second block of parables is found in chapters 14-16 of Luke. The third is found in chapters 21, 22, 24 and 25 of Matthew. Matthew 13:1 That same day Jesus went out of the house and sat by the lake. 2 Such large crowds gathered around him that he got into a boat and sat in it, while all the people stood on the shore. Fahling: This was to be one of the busiest days of which we have any knowledge in the life of our Lord, from the time when He was besieged by the multitudes upon His return to Capernaum until late in the same day, when He rested His weary head in the rocking bed of a storm-tossed ship on the Sea of Galilee. Ylvisaker: Jesus leaves the house where He healed the demonic, and where He clashed with the Scribes and the Pharisees. The multitude follows on His heels. First He was sitting on the seashore. But the press of the multitude caused Him to teach, in a sitting position, from a boat, while the large crowds stood on the seashore. To reveal and to conceal, verse 11. Knowledge of the mysteries of the Kingdom of Heaven is GIVEN to the disciples. But to the others ( rejecters) it has not been given. The receiver is given more and more, verse 12, but the rejecter is deprived of everything. This is a fulfillment of the prophecy at Isaiah 6:9. Ylvisaker: Either the 'mystery' is something which is incomprehensible or 'mystery' points to something which is concealed, which shall be revealed, but which shall remain undiscovered until God's Spirit discloses it unto us (1 Corinthians 2:14). . . . The parable has been compared appropriately with the pillar of a cloud and the pillar of fire which turned its dark side toward the Egyptians, and their fiery side toward the people of the Covenant. . . . The same light which shows the way to the one, will blind the eyes of the other. The parables become in this way an act of grace in the case of the disciples, but judgment against the intractable. Therefore it has been pertinently stated that the parables have a double face bearing the inscription 'judgment' and 'grace' and in harmony with this double standard, they serve to widen the breach which has begun to develop among the hearers of the Word. . . . God hardens only those who have permitted themselves to be hardened. This passage is quoted also by John (12:40) shortly before the account of the Passion and cited by Paul when he refers in the Epistle to the Romans to Israel (Romans 11 :8). Matthew 13:3 Then he told them many things in parables, saying: "A farmer went out to sow his seed. "Many things," extensively, seven on this same day. 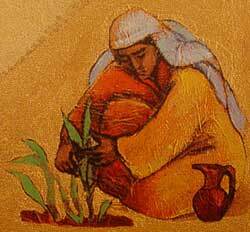 So far as we know, the parable of the Sower was the very first parable Jesus ever spoke. In a sense it is most important of all for it covers all of Christian living or the total lack thereof. Very important truths are taught by way of a simple everyday illustration. "A" is the generic article. We say: "The fisherman fishes!" meaning "every fisherman." By the way, fields in Palestine were quite small. The seed was cast by hand. There were no fences. The fields were small plots. Matthew 13:4 As he was scattering the seed, some fell along the path, and the birds came and ate it up. Note that the birds immediately devoured the seed which fell along the path. Matthew 13:5 Some fell on rocky places, where it did not have much soil. It sprang up quickly, because the soil was shallow. "Shallow" denotes a rock base with only a thin layer of soil. There was not much ground. The seed on the path did not germinate. The seed in verse 5 did so immediately. Despite the very thin soil it did germinate. Matthew 13:6 But when the sun came up, the plants were scorched, and they withered because they had no root. The first three words are a genitive absolute denoting the heat of high noon. During the growing season in Palestine the sun gets quite hot. "Scorched" denotes a burning of the seed from without. "Withered" denotes a drying up from within. The reason for both is given: it had no root despite the fact that it had germinated. Matthew 13:7 Other seed fell among thorns, which grew up and choked the plants. "Grew up" means that the thistles grew faster than the plants which came from seed. "And" is "with the result that" the thistles choked the good plants. Matthew 13:8 Still other seed fell on good soil, where it produced a crop--a hundred, sixty or thirty times what was sown. Note the repeated article, laying stress on the word "good." The seed was constantly giving fruit. The individual seeds varied as to their fruit. How often didn't Jesus say this! Compare the many passages in the margin at Matthew 11: 15. God put ears on sinners so that they might listen. Matthew 13:10-17 The disciples came to him and asked, "Why do you speak to the people in parables?" He replied, "The knowledge of the secrets of the kingdom of heaven has been given to you, but not to them. Whoever has will be given more, and he will have an abundance. Whoever does not have, even what he has will be taken from him. This is why I speak to them in parables: Though seeing, they do not see; though hearing, they do not hear or understand. In them is fulfilled the prophecy of Isaiah: 'You will be ever hearing but never understanding; you will be ever seeing but never perceiving. For this people's heart has become calloused; they hardly hear with their ears, and they have closed their eyes. Otherwise they might see with their eyes, hear with their ears, understand with their hearts and turn, and I would heal them.' But blessed are your eyes because they see, and your ears because they hear. For I tell you the truth, many prophets and righteous men longed to see what you see but did not see it, and to hear what you hear but did not hear it." In verse 10 we are told that the disciples had approached Jesus with a question. Verses 11-17 comprise His answer which we have already discussed. "Listen then" goes back to verses 16-17. How thrilled the disciples must have been to hear that their eyes were blessed in that they saw Jesus and their ears to hear His very Words! How thrilled they must have been to see and hear what many prophets and saints of the Old Testament had not seen and heard. Just because they were so highly blessed did not mean that they did not need to hear, hear effectively. 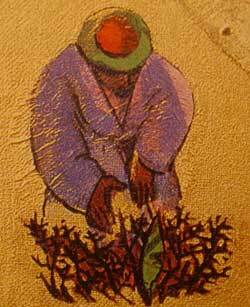 "Of the sower" is adjectival, distinguishing this parable from the others. "Listen" here means to hear with explanation. The fact that Jesus had to explain to them does not mean that they were rejecting. It reminds us of the important truth that unless Jesus and the Holy Spirit bless and explain, not even the disciples understand. The revelation of the mysteries of the Kingdom of Heaven comes not by reason and human strength but only of the Holy Spirit through the Word. Matthew 13:19 When anyone hears the message about the kingdom and does not understand it, the evil one comes and snatches away what was sown in his heart. This is the seed sown along the path. Note that forms of "anyone" occur in all cases, verses 19,20,22, and 23. All heard. But this is all that they had in common. When anyone hears the Word of the Kingdom but does not understand it amounts to "hear and reject." Here Jesus is picturing the ancient and modern Pharisees noted in verses 14-15. Luther: It went in one ear and out of the other. When Jesus would speak they would turn up their noses at Him (Luke 16:14). And these Pharisees, like their modern counterparts, had many hangers-on among the common people. Satan's purpose is to cause a violent rejection of the Word, the seed. By the way, the point of comparison in the word "seed" is that the Word is life-giving. Only the Gospel gives spiritual life, nothing else. This verse does not mean that the hearer is helpless but that he works in league with the devil. Nonetheless, it is a warning to all Christians. The Christian has the shield of faith with which to ward off the fiery darts of Satan. He must use that shield, for Satan is far more powerful than is the Christian on his own. Unless we watch and pray, Satan can seize the seed before it germinates. The last sentence in verse 19 necessitates comment. The person, not the seed is the object. KJV, NKJV, JB and NASB are correct. RSV, NIV, NEB, and AAT are incorrect. Jesus is speaking of the person. The fault lay with the person, not with the seed. Matthew 13:20 The one who received the seed that fell on rocky places is the man who hears the word and at once receives it with joy. Here we have the same problem as at the end of verse 19. LB, RSV, TEV, NIV and NEB again make it the seed, not the person. In illustration, verse 5, we were told that, though the seed germinated, it had no root because the soil was thin. In application this means the emotional hearer whose thrill is very short-lived. Stoeckhardt: They change with the weather. Ylvisaker: This is the populace in its wild enthusiasm for the Saviour, soon a thing of the past; today 'Hosanna' and tomorrow 'Crucify Him'. These are the emotional, superficial sentimentalists who are so easily impressed by the Word, who are moved to tears and make good resolutions. But they would retain at the same time the contrariness of an unbroken heart, and therefore they lapse again into the sleep of death and destruction. Lenski: This is the one who leads you to expect great things of him. Matthew 13:21 But since he has no root, he lasts only a short time. When trouble or persecution comes because of the word, he quickly falls away. He did not allow the Word to root itself in him. That is the obvious meaning from what follows. "But" means "quite to the contrary." "Trouble" is a general word denoting any and all kinds of affliction, adversity. These things "press in on" the hearer. That is the meaning of "because of the Word." "Persecution on account of the Word (of God)" is particular. These things come to all Christians. Sooner or later all of us suffer because of what we believe on the basis of the Word. "Quickly he falls away" is "immediately he is trapped" not because he has no help but because he feels cheated, too good to suffer affliction and persecution. He considers the Word beneath his own dignity and just not worth the suffering and persecution. Note the word "immediately." All of us are tempted to give up in the face of suffering and persecution. That is not sin. But to "be offended immediately" betrays the fact that the Word had not taken root. He yielded to temptation. Matthew 13:22 The one who received the seed that fell among the thorns is the man who hears the word, but the worries of this life and the deceitfulness of wealth choke it, making it unfruitful. "The one" denotes the person, not the seed, nor the ground. KJV, NKJV, JB and NASB are recommended, not the others, especially not LB which reads "The ground covered with thistles represents the man . . ."
By the way, Jesus is not comparing soils in the sense that some people are better by nature than others. The translation in LB is a pitfall for the synergists who reasons that the first three classes are worse by nature than the last. That's not what Jesus is saying. He is comparing PERSONS. Hosea 13:9 should never be forgotten: "You are destroying yourself, Israel: but in Me is your help." (AAT). If a person is lost it is wholly his own fault. If he is saved it is wholly of the grace of God, in Christ. In verse 7 we read that the thistles outgrew and choked the seed. Here application is made. By faith in Jesus the Christian can overcome the faithless worries that arise out of this age. By faith he can resist the deceitful pleasure that arises out of the desire for wealth. The Word brings spiritual pleasures. This age can offer only anxiety and passing pleasures. Once they mean more than what the Word offers, the person is in danger. They literally choke the Word, make it ineffective. Thomas Magister (14th century): Trees which are styled fruitful are those the fruit of which is serviceable for food to men; unfruitful, on the other hand, are those, the fruit of which men do not use for food; but, fruitless, in the sense of having no fruit, is not found in any of the ancients. In other words, in nature all plants bear fruit. The only difference is that some can be eaten, others not. Therefore, in verse 22, fruitless denotes the person totally devoid of fruit, no matter what kind. Matthew 13:23 But the one who received the seed that fell on good soil is the man who hears the word and understands it. He produces a crop, yielding a hundred, sixty or thirty times what was sown." "The one" denotes the person, not the seed or the ground. Matthew says that this man understands the Word; Mark, "that he accepts it;" Luke, "that he holds it fast." Note that Matthew repeats this verb from verses 13-15. In verse 19 it was said that he did not understand. The Word was immediately rejected. The word "understand" does not occur in verses 20-22. In verse 20 we have "received it", but it is very short-lived. In verse 22, though, evidently the hearing lasted somewhat longer, nonetheless neither "understand" nor "receive" are found. These three "crops" denote the fruit. The text is not speaking of classes of hearers. Bengel: A single hearer's three several grains, so to speak, is signified by a hundred, sixty and thirty. Lenski: Jesus says that this man, in whose case the seed has been sown on the good earth, makes one seed a hundred, another seed sixty, another seed thirty seeds. . . . The Word as such is, indeed, a fixed entity which is neither to be increased or decreased; its multiplication lies in its spread in one heart and from one heart to other hearts. This is how the Word bears fruit. Jesus is speaking of sanctification. Compare John 15:5: "He that abides in Me and I in him, this one bears much fruit, because apart from Me you are able to do nothing." Ylvisaker: When reference is made to the 'good soil' it is evident to anyone familiar with the Scriptures that this is not a word-picture of the soil as it is found by the Word. The Word itself must, through its divine and inherent power, produce the good soil. Of unwilling hearts it must create hearts that are willing, as our Confessions declare. Correct. The collect for the Word is in place here: "Blessed Lord, who hast caused all Holy Scriptures to be written for our learning, grant that we may in such wise hear them, read, mark, learn, and inwardly digest them, that by patience and comfort of Thy holy Word we may embrace, and ever hold fast, the blessed hope of everlasting life, which Thou hast given us in our Savior Jesus Christ, who liveth and reigneth with Thee and the Holy Ghost, ever one God, world without end." Adapted from Exegetical Notes, Series A Matthew-John Sundays After Pentecost Gospel Texts, by Harold H. Buls, Concordia Theological Seminary Press: Ft Wayne IN, 1981, pp. 25-28. Used with permission.